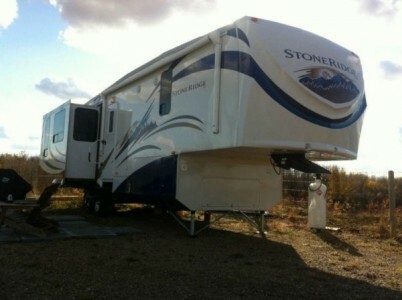 2011 K-Z Stoneridge fifth wheel. Just in time for summer holidays!!! This mint condition, 34' 2011 Stoneridge trailer has been kept inside a heated shop, taken out for only one road trip to the Vermillion Fair! Luxuriously equipped with A/C, 42" & 24" flatscreen TVs, surround sound, interior/exterior speakers, built-in vac, microwave, fireplace, DVD, 3 slides and much more! Priced to sell. Please call 780-220-0539. 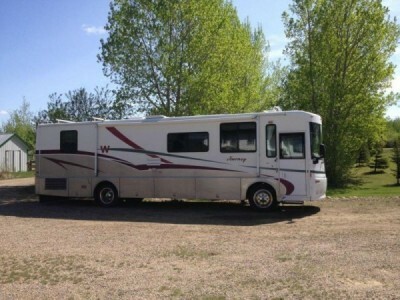 2005 Holiday Rambler Scepter 40ft Class-A Motorhome, diesel- pusher. Exhaust brakes, 400HP Cummins, new tires and batteries, oak cabinets, washer/dryer, 4 slides, ice machine, large side by side refrigerator, with double top freezers. Excellent condition. Please call 807-227-2194. 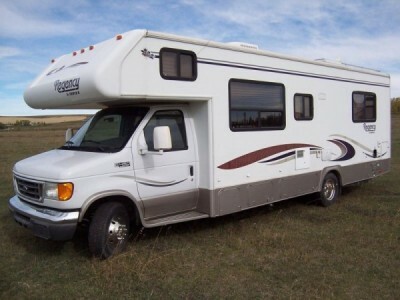 2009 Chateau Sport Class-C Motorhome. 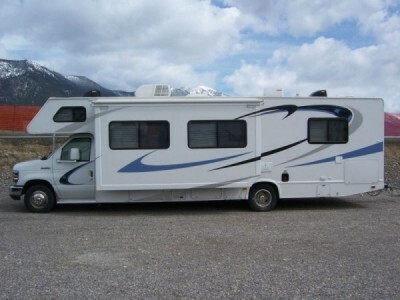 Fully loaded and upgraded immaculate Motorhome. Sleeps six. 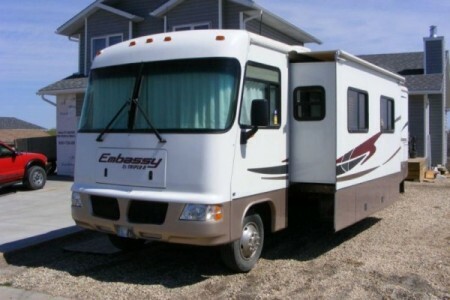 Includes leather dinette/air conditioning/ stove/ oven/ microwave/ stereo system. Electronic slide out dinette. Loads of storage. Tub and shower. Excellent condition. Please call 403-941-3724. 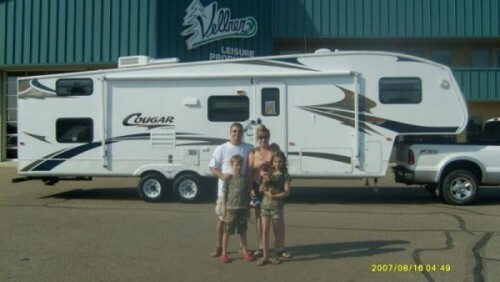 2009 Heartland Landmark 39ft Fifth Wheel. Pinehurst Floorplan Length: 38’ 8” GVW: 2,295 lbs INTERIOR • Amish-Crafted Natural All-Hardwood Cabinet Stiles, Doors and Drawers w/Cherry Stain. Recent Alberta vehicle inspection White, loaded excellent condition Please call 780-222-6516. 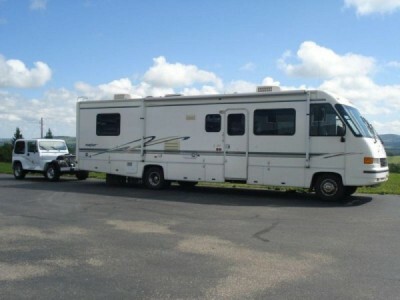 2006 American Tradition 40FT Class-A Motorhome. 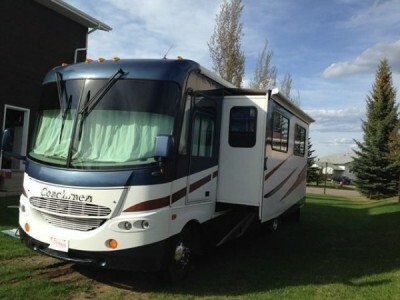 Immaculate luxury RV! 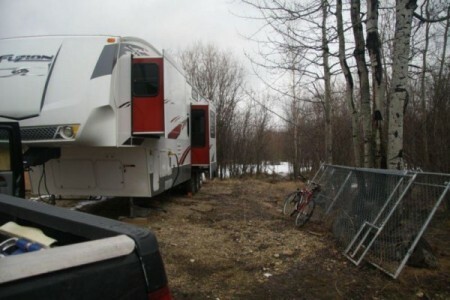 40 foot with all the amenities, more pics available upon request.Comes with jeep to pull behind. Call or text 204-856-6544. 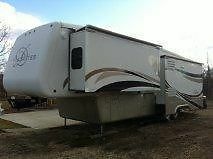 2008 Cougar 314BHS 5th wheel and a 2006 Ford F350 Lariat FX4 Super Duty. The truck just had $9000 worth of work on the motor - replaced the HP Oil Pump, heads machined, head gaskets and studs replaced, EGC removed. Other additions, Injen Cold Air intake, Amsoil bypass oil filtering system, Superchips performance programmer. The truck is fully loaded, leather, air, remote starter, power windows/seats, heated seats, etc. Always ran Amsoil Synthetic oil, transmission, differentials and motor. 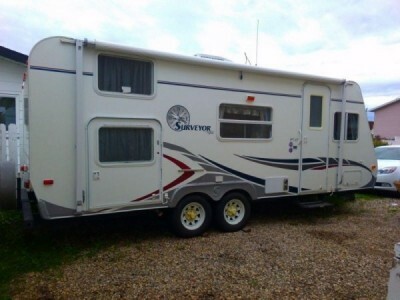 5th Wheel Trailer - good condition, new tires, fully outfitted, Dishes, pots/pans, Bunn coffee machine, linens, bedding, hoses, cords, tools, portable sewer tank, portable 50 gal water tank with pump, chairs, BBQ, etc. Give me a call @ 780-381-7865 if you are interested. 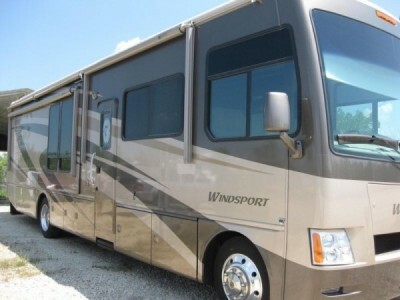 2009 Fourwinds Windsport 36ft Class-A motorhome, V10 362hp ford 5 speed trans with tow haul, full body paint 3m front mask 1piece w/s raised body with pass through storage slides 14 ft 18ft, 2 remote awnings with wind sensors 22.5 aluminum wheels & Michelin tires 3 flat screen TVs in living rm dining rm & bedroom his & hers mirrored closets queen bed porcelain toilet teak dining table & 4 chairs beige leather sofa bed & captains chairs 2 cognac recliners with ottomans corian counter & island convection microwave oven purchased new in March 2010 no pets no shoes nonsmoking no kids, show room condition. Please call 204-999-8891. 1998 Georgie Boy Pursuit 36ft Class-A Motorhome, with Jeep YJ Painted to match. This is a complete unit ready to roll. 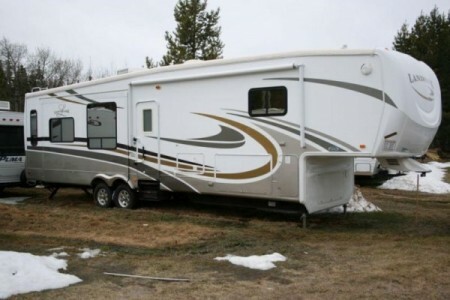 1 large living room pullout, rear queen island bed, generator, gas engine, 2 roof top a/c, solar panels, big foot levelers, Ford chasis, 2 TV's, mid-ship bathroom and shower, Microwave, oven, stove, dinette, pantry, loads of storage and numerous extras. As new condition - always stored indoors. Includes 1991 Jeep YJ, loaded 6 cyl standard, custom fitted rock shields. Please call 403-650-2923. 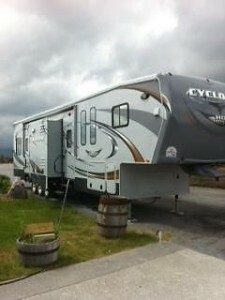 2011 Heartland Cyclone 3814 Toy Hauler. We purchased this unit and have found that we dont use it as we thought so our loss is you gain. We have owned it from new and have only used it 6 times. Excellent condition, sleeps 8 comfortably but can accommodate 10. Hydraulic Jacks Front and rear, Electric Jacks, Fuel Station, Cummings Generator 5500, 3 Slides, Rubber Roof, Washer and Dryer, 14 foot Garage ( Haul all your toys or a car), Outdoor Lighting, Carpet for Garage, Forced air furnace and A/C, 3 Fantastic fans with auto rain gaurd, 2 TV's with hook ups for outside TV and Stereo, Fully automatic Electric awning, Vacuflow with floor sweep, Rear Plumbing, Extra large bathroom, 130 gallon fresh water storage, tons of space in every corner, Corean counters, leather sofas with embroidered HD graphics. And many more features. Please call 403-371-7056. 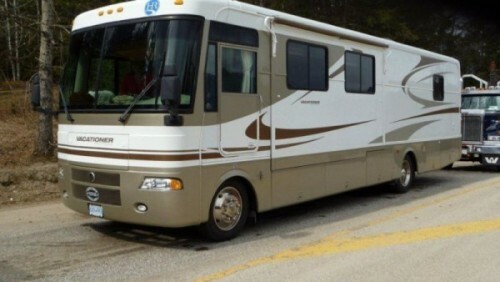 2002 Fleetwood Bounder 32S Class-A Motorhome 32-Foot, Vortec 8.1L, Automatic, Gasoline, Beige, R1039B, 2 Slides, 2 Air Conditioners, Cable Hook up, Satellite dish, 120-Watt Solar Panel, Back up Camera, Brand new Tires, 5500 Marquis Propane Generator, New Queen Memory Foam Mattress, DVD player, Awning Slip-in Shade Screen, Portable end table, New Windshield, Back up Camera, Awning over Dinette Slide, Windshield and Side window covers, Cable hook up, DC Converter, New microwave, Extra sewer hoses, Assist step handle for easy entry. Please call 403-529-7279. 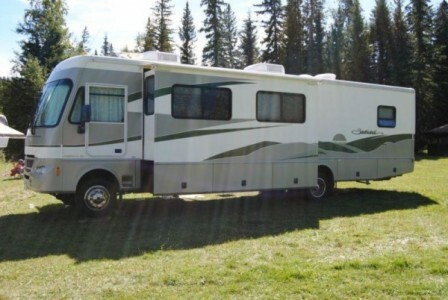 2005 Forest River Surveyor, super light 1720kg, 23 feet, Air conditioner, furnaces propane, new tires, very good condition, 3 beds, 1 double & 2 queen, fridge electrical or propane, showers & bath, The perfect camper for traveling. Please call 780-501-7171. 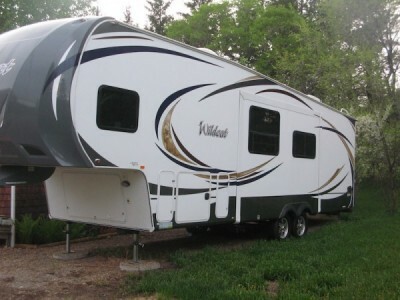 2009 Keystone Fuzion 402 Toy Hauler. Only used 3 times. 3 slides, 5500 kw generator, washer / dryer hook up, sleeps 10. Air conditioning . Remote fueling station for your toys. 2 TVs - lots of room for entertaining. Please call 780-380-7768. 2013 Dutchman Kodiak 263RLS. Save over $6000.00 on this brand new trailer over buying from a dealer...NO GST! We have reduced the price and are selling this at our cost. It is absolutely new and unused with full factory warranty. My wife and I just had this shipped from the US. It is all aluminum hardwall construction and at 5716 lbs....light enough to be towed by half ton BUT incredibly roomy inside! This is a Rear Living model, not a bunkhouse. This is the RV Industry's TOP lightweight with:.. Seamless Windows - Deep slide, Heated and enclosed underbelly, Bear Cave storage, Polar package insulation, Solid surface countertops, Skylight X 2, Beaufloor floor with 10 year warranty, Power awning, Power Tongue Jack, Flat screen LCD TV, Premium Entertainment System...AM/FM/DVD/MP3 with outdoor speakers, Aluminum wheels, Exterior Spray Port, Detachable 30 AMP Power Cord, Swing out BBQ, 3-way sofa, 4 Stabilizer Jacks. Please call 780-299-7418. 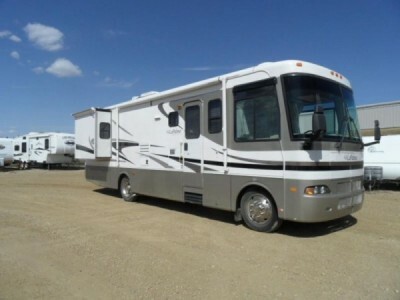 2006 Newmar Scottsdale 34-foot class-A motorhome. Excellent condition. 10 cyl, Ford titian engine with plenty of power to pull a car through passes. It has two large slides and a large awning. It also has a large generator, there is a lot of nice wood trim. The price is firm since it is listed below market value for a quick sale. It has had a full out of province vehicle inspection and passed perfect in every item except for wind shield wipers which have now been replaced. It is now registered in Alberta. This motor home drives very nice, and feels like new. Please call 1-403-845-6046. It is located 2 kl out of Rocky Mtn. House AB. Please call 403-845-6046. 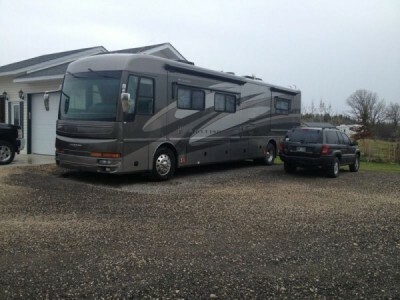 2003 Holiday Rambler Vacationer 37Ft Class-A motorhome fore sale. Fully equipped with all the luxuries, with 2 slide outs. Upgraded inverter and televisions. Please call 250-804-9769. 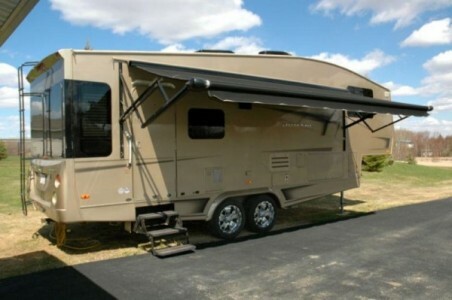 2008 Carriage Domani DF300 31Ft Fifth Wheel. This is one of the finer fifth wheels on the road. There are many options so I will list a few of them without getting overly detailed. 20" American Racing wheels mounted on 4 Dexter independant Tor-Flex axles. 3 Samsung flat screen TV's with one exterior connection. Corian counter tops. Electric stabilizing jacks. 30 inch sharp convection microwave with exterior vent. 3 interior skylights. Central vacuum sytem. Fantastic vents in living room and bathroom. LED road lighting. Halogen ceiling lighting with dimmers. Shaw carpeting and real hardwood flooring. Both gas and electric heating options for hot water tank. 15,000 BTU Carrier A/C with heat pump. 3M water purifier sytem. Polk audio complete entertainment system. flush mount windows all round. Full body paint in sandstone color. This coach has been very well maintained in and out. Original owner. Purchased new in 2009. Please call 780-918-5637 to view. 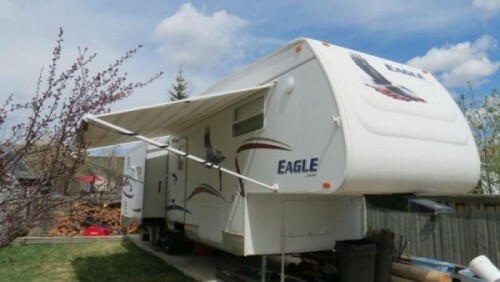 2005 Jayco Eagle 29.5Ft fifth wheel. 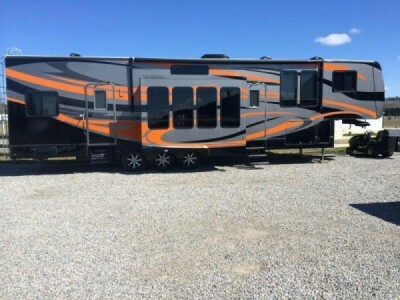 If your looking for a Fifth Wheel in excellent condition with everything working and shows like new this is the one. We have owned this unit since July 2008. It has been keep up like new. Used about 3 weeks per year at the lake. Comes with Three slides including Master bedroom, kitchen and living room slide outs. 2 Tv's and one is flat screen with dolby Digital 5.1 surround sound system. Lots of cabinets for storage. 7 ft ceiling in the shower and sky light. Dinette has 4 chairs. Living room couch folds out into a bed. Power vent in washroom, Wired for cable Tv, Central AC/ Dual Battery Box, Fibreglasss sidewalls, Laundry shute, plenty of understorage capacity, outside shower, day/night shades, Roof ladder, Roof mount Radio Antenna, Rubber roof, 8 cubic ft fridge, Double propane tanks, 40 gal fresh water capacity, gray water cap 74 gal, black water capacity, 37 gal, 16 ft awning, water purification system, Call for your personal viewing. You will be impressed. Please call 403-804-7314 to view. sat ready,Micro,running boards, emergency start kit, 5000lb. 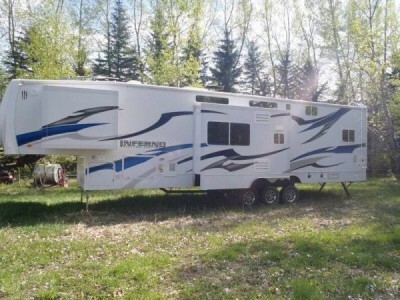 trailer hitch, slide out room awnings, power bath vent,deadbolt entry door, skylight in shower, water heater bypass system,roof ladder,13.4 btu roof a/c front, 4.0 micro quiet generator, 6 gal. gas water heater, large double bowl sink,china bowl toilet, queen walk around bed, queen bed bedspread, pillows shams, glass shower door, fabric barrel chair, booth dinette, day/night shades throughout,30,000 btu furnace,Infiness leather hide a bed sofa w/ air mattress( used once),26" LTD TV on elec. swivel side mounted in cab over, much more. MAKE A OFFER. Please call 403-988-2717 for more info. 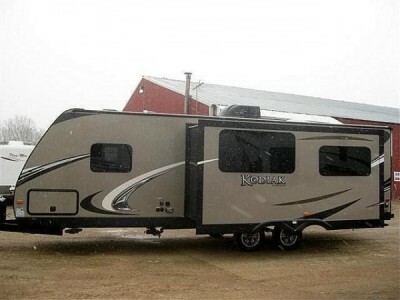 2011 Keystone Fusion Toy Hauler for sale! Only been used 6 times. This trailer is loaded. 10ft garage, 2 queen bunks in garage (bottom bunk turns into table), garage has a TV mounted in back, master bedroom has double bed and TV, large bathroom, separate stand alone shower, nice open living area with table and wrap around seating, Large TV in living area, micro wave, 3 burner stove top and oven, large fridge and freezer, generator built it in to trailer, comes with inverter, and solar panels mounted on roof, satellite mounted on roof, comes with rear door deck and accessories, everything is electric. Lots of storage. Too many options to list. Please call Kevin at 403-330-9147 to view. 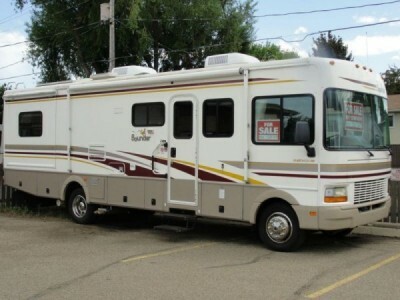 2003 Fleetwood Southwind 35R Class-A Motorhome. Completely loaded, Workhorse W22 Chassis, w/8. 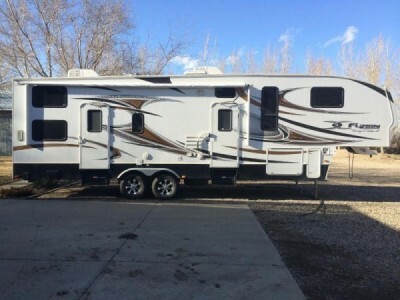 1litre Vortec 340HP & Allison 5-Speed Trans., 2 Large Slides, Double Door Fridge w/Icemaker, 5.5 Kw Onan Generator, Leather/Power Drivers Seat and Leather Passenger Seat, Power Deluxe Awning, Tires are like new, In excellent shape - must be seen! PRICE REDUCED AGAIN!!! 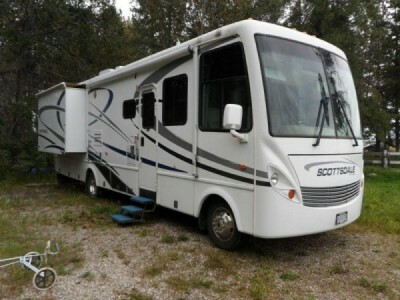 Motorhome also comes with dishes, pot and pans, plus a new Coleman camp stove for cooking outside! WILL HAVE A FULL TANK OF GAS WHEN YOU TAKE IT HOME. Please call 403-391-1637 to view. 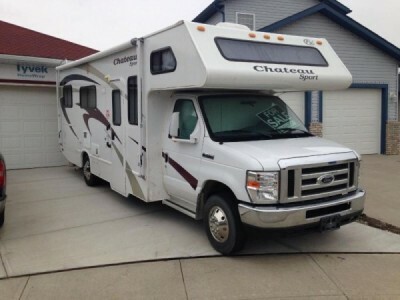 2006 Coachman Aurora 3180DS, 32Ft, Ford V10 - Motor & Chasis, 2 Owner Class A Motorhome "Like New Condition", 2 Pull-Outs, Ample Storage, Walk Around Queen Size Bed, Unit Fully Self-Contained with a 5.5 KW Generator, Great Motorhome at a GREAT PRICE. Please call 780-689-8786 for more info. 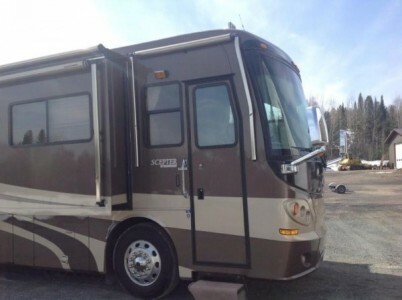 2003 Monaco LaPalma 32-ft Class-A Motorhome, Fully Loaded, Cherry Cabinetry and Trim. New upgraded Laminate Tile Flooring. New 32 inch flat screen TV and 19 inch TV in Bedroom. Sleeps 6 persons. Numerous options on this gorgeous motorhome to mention - must been seen to be appreciated!! Call (403) 887-5093 to View. Please call 403-887-5093. 2010 K-Z Inferno 4012 Toy Hauler Fifth wheel., 5500 watt onan generator with seperate fuel tank plumbed straight into generator, fuel tank with electric pump and nozzle for your machines, outside shower on valve/dump control panel, outside speakers with subwoofer and sony mp3,CD player, electric awning, electric level jacks, huge pass through storage, dirt devil vacuum, air ride hitch, upgraded low profile a/c unit, rain sending vents with temp controlled fans, second fridge in garage with connections to beer tap on wall(never used), inferno painted table and chairs in garage, floor tie down rings anchored to frame, bunks in garage on electric rail to raise and lower. Bottom bunk can convert into bench. Bug screen on rear cargo door to leave open, lots of cupboards and cabinets with air shock style hinges so they stay open and don't have to slam to close, inside sony stereo system hooked up TV in garage, living area and master bedroom, huge bathroom with spacious shower, porcelain toilet and sink. Seperate entrances to bathroom, reading lamps in master with huge closet with sliding glass mirror doors and dresser. axles are currently flipped and has added 4" subframe for extra clearance ($3200). trailer used for total of 3 weeks. Parked at a campground in town for majority of time. Never been cooked inside. Curt Fifth wheel receiver for truck available as well. Please call 403-597-5933. 2010 Gulf Stream Wide Open 40FT Toy Hauler. This beautiful tri-axel trailer has many extras. Beautiful black, orange & grey paint job. 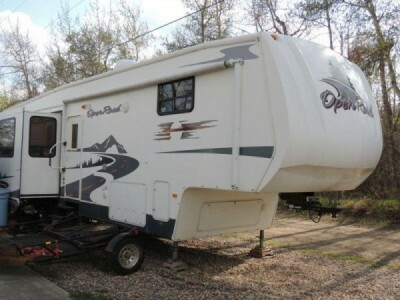 5500 Onan built in generator c/w 90 l gas fuel tank, quad filling station w/separate 90 l gas fuel tank, electric power awning, 3- slides, 12' garage w/2- huge beds that telescope up to the ceiling to make room for toys. 2 bath rooms, (1/2 bath in the garage), 4- TV's (1 outside as well as 1 in the garage, the kids used as a gaming TV or watching movies), central vac, prepped for washer & dryer, indoor/outdoor sound system, (can be adjusted to any room in the trailer or outside for your listening pleasure). Huge double fridge w/water/rum dispenser & ice maker, convection micro wave oven as well as a stove top. Cooking island for more storage & food prep area. Lots of storage. Under bed storage in main bedroom. Security cameras in rear & over main door (you can watch on your TV). In vehicle monitor to watch inside the garage as you travel down the road. 2 air vents in garage as well as a furnace air duct plumbed into the garage. Please call 403-638-7637. 2013 Wildcat 323QB Front Bunk House. Great family friendly floor plan with 4 bunks in front private room. Your kids will love it. Touring Edition Upgrade Package (Gun Metal finish and LED lighting). Like New Condition! Plenty of storage inside and out with large exterior pass through. Flat Screen TV and Outdoor Speakers with window for outdoor movie nights. Sound system/DVD player with IPOD jack. 3 slides. Sleeps up to 10. 50 Amp service upgrade with 15K BTU Air Conditioner. Canadian CSA approved. Easy Setup with electric front and rear jacks plus electric awning. Dealer installed Boat hitch and wiring. All original documentation included. Please call 780-893-8191.